Good morning kids. The weekend is here and, all together now, what a week it's been. 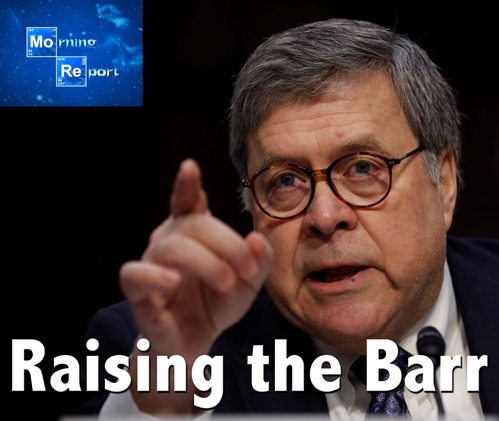 The over two-year long constant drum beat and narrative that Trump with the aid of Putin stole the 2016 presidential election has been turned on its head by Attorney General William Barr's unassailable and unimpeachable (heh) declaration of his belief that it was the President that was spied on during the course of the election and even afterwards. Despite my cynicism of any of the real culprits in all of this ever facing serious consequences for what amounts to treasonous behavior, Greg Craig, Obama's White House counsel and a big time Leftist was indicted for giving false statements about his work as a foreign agent for the government of Ukraine in 2012. Ironically, this came out as a result of the Mueller inquisition of Trump. As far as William Barr is concerned, remember that he's been working in DC for a long time and as a member of the Bush 41 regime. Supporting the conclusions of Mueller's nothing-burger and deception is one thing, but to publicly confirm what we all know vis a vis Trump being the victim is something else. He's now going against the family - the Deep State. ...Consider the following: the media convinced millions of people that the president of the United States was some kind of Russian agent and for two years peddled this story without a shred of evidence. The investigation into Trump began under shadowy circumstances that remain obscure even to the most vigilant observers. ...The president is in a stronger position politically than he has ever been in his presidency, and that is no small thing. But a wide institutional power gap abides. While the Democrats will suffer, the institutions that support them will not, and the Democrats will continue to draw power from those institutions... Here is what should happen: Every journalist who breathlessly promoted this nonsense should be fired and publicly shamed, and the Democrats who peddled this hoax should resign. The DOJ/FBI/CIA hacks who made a killing on the networks and on their book tours should withdraw from public life in utter disgrace. Trump should declassify everything and pursue those responsible. It's tough to read the whole thing, though you should, but the fact of the matter is the damage has been done, both to this President in terms of his ability to move his agenda forward and more broadly and much more critically to what was already a red nether hair-thin trust in our leaders and institutions. That has been irreparably damaged. I think this is one of the reasons why even a long time resident of DC like William Barr did what he did in stating the truth about Trump, out of perhaps a sense of wanting to restore the shattered credibility of the DoJ. It's a noble pursuit but all things considered on that is in vain. Things cannot and most certainly will not go on as before. We really are in uncharted territory politically and culturally. Maybe that's a good thing. In a not unrelated story below, the so-called "progressives" in the Democrat Party are openly letting their freak flags fly for all the world to see, and despite what the propagandists are pimping, most average Americans today even after two generations of brainwashing in the schools are repulsed by it. It was the 8 long, dreadful years of Obama pretending to be "moderate" and running what was in fact a criminal operation out of the White House to fundamentally mutilate this country into slightly less than second world dump that got us Trump. And Obama was not only aided and abetted by fully weaponized media propaganda arm but by a GOP political class that had no problem with what he and his fellow travelers had in store for us, so long as they could make a buck off of our extinction as a nation and culture. And yet, I see a very bright silver lining in all of this. Had G-d forbid Hillary won the election none of this ever would have seen the light of day and she and her cohorts would have ground the rubble of our nation created by Obama's destruction into a fine powder. The only reason that I and many of you voted for the loud, tacky orange-complected gavone from Queens was to prevent Hillary from finishing off whatever was left of America as founded. On that glorious Tuesday evening in November of 2016, that mission was accomplished. Yet, despite all of the aforementioned, look what he and his allies were still able to accomplish in terms of tangible things like the economy and foreign policy an intangible things like sparking a re-emancipation of American blacks, Jews, Latinos and others from the blood-sucking liars of the Democrat-Left and the explosion of the myth of an unbiased, honest news media. Will Trump alone restore America? Of course not. We are a divided nation right now, and perhaps never to be reunited all things considered. But it is better to have all of this out in the open and to be able to fight to stave off the twin evils of Leftism and Islamism from conquering us for good. Not the end. Not the beginning of the end. But the end of the beginning. On to the rest of the news starting with the border crisis and immigration where the migrant horde invasion is getting worse by the day, what amounts to biological warfare is also coming across the border with the invaders, and the Center for Immigration Studies gives us a sobering statistic. Democrat Scandal Sheet and Officially Sanctioned Anti-Semitism: "Tank" Abrams under investigation by a state ethics commission despite now claiming victory in the Israeli elections (just kidding), Kim Foxx let a convicted killer off the hook in the name of social justice, the Manhattan DA knew friend of Clinton Jeffrey Epstein was a sick pedo while arguing for leniency, and Blotto O'Rourke's shady real estate deal with a campaign donor. All shocking! Meanwhile the so-called "Justice Democrats" are all outraged because the NY Post called out "Bro-Fo" Omar for the dark age pig-ignorant anti-Semite she is. Civil War 2.0: The Left's world-famous non-violence and tolerance were on full display at the University of Missouri when a reporter for the Daily Wire got sprayed with bleach in the face, and a look at the persecution of Kirsjen Nielsen post-Trump administration. The organized ability to deprive anyone of a livelihood won't end with just political figures and has got to be stopped. By any means necessary. Politics: Home Depot co-founder lays out the truth about the Dems, Progressives are mainstreaming the lunatic fringe (let a thousand freak flags fly), Rabbi Fischer with good advice for Trump, Nydia Velazquez has a fever and the only cure is more gulags, CNN blindsides Joe Bidet with ancient stuff about school busing, Joe's Man-Chin stumps for the Maine frump, and a look at the anti-American front groups ADL and SPLC and the "white nationalism" hoax/libeling. First Amendment and Fake News Fakery: Several good links on the arrest of Wikileaks Julian Assange, two about the attempt by Google et al to destroy Unplanned, and Google pushing back on the blacklisting story. Abortion: Governor DeWine signs Ohio heartbeat bill, the same one John "the self-licking postage stamp" Kasich vetoed twice. Foreign Desk: More on the Assange arrest, VP Pence gives Venezuelan ambassador the death stare at the UN and nicely tells him to GTFO, senior US official visits Taiwan to celebrate 40 year Taiwan Relations Act, NATO in crisis and a look at Poland's troubling past and present vis a vis anti-Semitism. DEE-fense: Export controls needed to protect our defense high tech and Senators leery about the Space Force. Domestic Affairs: As promised, Congressional Dems are going to continue persecuting Justice Kavanaugh, new Interior Dept. chief confirmed despite enviro-commie opposition, and a report says Trump may dissolve the Office of Personnel Management. Might have to do that with a few missiles aimed at Peking. Meh, take out Google's servers instead. Same diff. Economy: Can Judges Buch M. Danno and Tyne E. Bubbles destroy America's new position as the global petroleum leader, and a look at Chi-Com's goal of destroying the almighty dollar. Healthcare: Deputy Press Secretary Gidley torches Democrat Medicare for All, and legal challenges to De Bolshevik's forced measles shots. Real Science: A look at the failed Israeli lunar lander attempt. Feminazism and Transgender Madness: A rhetorical question has been axed. Hither and Yon: Go see Hotel Mumbai and Unplanned, Trump classy visit with 95-year-old World War 2 vet, the dying religion of Christian Science and Daniel Greenfield explodes "white privilege." Trump on "Collusion" Plotters: "It was an Illegal Investigation ... Attempted Coup ... Treason"
Good Roger Simon: Who's Worse - Julian Assange or the New York Times and Washington Post? Unplanned Director on Big Tech Companies: "Make the Algorithms Public"
Toto: Culture War - Google Labels Unplanned "Propaganda"
Former Ecuadorian President Blasts Successor For Lifting Assange's Asylum: "The Greatest Traitor"
At UN, VP Pence Looks Directly At Venezuelan Ambassador, Says "You Shouldn't Be Here"
Trump's New Interior Chief Confirmed Despite Dems' Fear-Mongering/Lying About "Climate Change"
America Has Quietly Become the Global Oil Superpower; Will the Courts Stop That Too? White House Deputy Press Secretary Gidely: Medicare For All a "Complete and Total Joke"
Greenfield: How a Survey on Race Disproves "White Privilege"